Some journalists will tell you that they require face to face access to musicians to get anything out of them worth writing about. While this is undoubtedly true in certain cases, especially if the interviewee has a reputation as being 'difficult', it simply doesn't hold water in my experience and probably tells you more about the interviewer and their need to inject autobiographical detail into story (or at the very least, their desire to meet to pretend that someone famous is their friend for the afternoon). Most journalists like to get up close to their prey and feel that they can only be satisfied that they are being told the truth after their mark has been stared intently up and down as if by Larry David trying to ascertain if he's being lied to or not. In fact there are just as many interviewees who are better value on email than they are in person. The truth of the matter is that many auto-didacts, pot heads, shrinking violets and socially awkward people who have trouble collecting their thoughts in person actually express themselves much better during a lengthy email exchange. And then you get quote machines, the raconteurs and born storytellers like Noel Gallagher who would probably be as at home giving a one on one interview down the pub as they would be holding a press conference by smoke signal or semaphore. 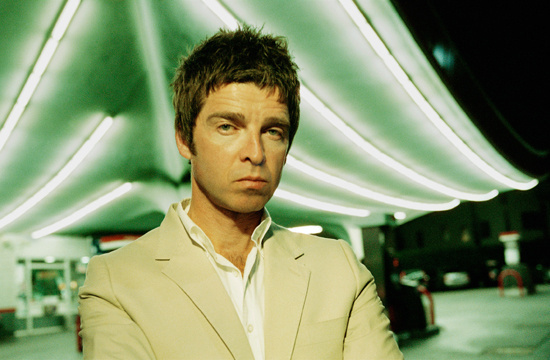 When I interviewed Noel Gallagher recently for a feature on his High Flying Birds project, it was exactly as instructive and as much of a good laugh as I presumed it would be. And by the time our allotted thirty minutes had warped into 70 minutes and I could hear a press dude in the background hissing "five minutes!" and "stop!" hysterically at him, he'd generously given me enough material for another feature. Anyway, to see Noel's 13 favourite albums, click on the image below. And cheers to him for being a stand-up dude, despite the grief we've given him in the past.